In honor of National Law Enforcement Week May 13-19, the Eddy County Sheriff’s Office and Artesia, Carlsbad and Loving Police Departments, along with members of the Regional Eddy County Dispatch Authority, held the annual Eddy County Law Enforcement Memorial Service this morning at Bulldog Bowl, honoring law enforcement officers who have fallen in the line of duty. Eddy County Sheriff Mark Cage, pictured above, led the service, with Rev. David Grousnick offering a prayer before speeches were given by Cage and Artesia Mayor Raye Miller. 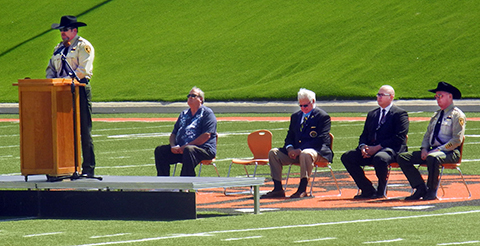 Mike Thornton, Medal of Honor recipient, Vietnam, gave the keynote address.